If you’ve been trying not to fall in love with butcher block countertops, then don’t read this post! These countertops are unbelievably gorgeous and create such an artistic feel to an everyday kitchen. As excited as I am about my gorgeous kitchen, I’m almost hesitant to show you this before I show you my one-year-old’s updated dinosaur room, because DIY to my husband, who built the kitchen island, is a lot better than DIY from me. I use glue guns, he uses power tools…. Oh well! Here it is!! IT IS GORGEOUS!!! We got our countertops from a company called Chop Bloc. They are edge grain walnut but Chop Bloc has all sorts of wood and style options to choose from. Traditionally, butcher blocks are end grain and cutting boards are edge grain. But take note, because although more expensive, End grain is better for your knives, require less maintenance and will last longer than an edge grain cutting board. I was really worried when my husband first suggested that we put in butcher block counter tops. I thought they would be really high maintenence. As it turns out though, they take just as little maintenance as any other countertop, and the best part is if something drastic happens to them, you can sand them down and refinish them! My favorite thing to do lately is shoot photos for the blog on my countertops! When the sun hits them from any angle you get a different look. I love the colors and textures that the light brings out in them and they are the perfect background for any photo! My husband Ben designed and built the steel base for our island, (a.k.a. he is amazing) and I absolutely LOVE it! It is beautiful and provides so much more room for cooking. He has done quite a few rustic industrial projects around our house lately and I am so excited to see it all coming together. I picked these chairs up at Target for $80 each (a splurge) to complete it all! It is so nice to be able to have a place for my two year old to eat breakfast without him messing up the dining table. He can’t get down from these chairs yet so I am loving that the mess is contained, but he still feels like a big boy! Mommy Hack Side Note: You may have noticed we didn’t put any hardware on our cabinets. We did that because we really like the minimalistic, clean look, but also because I wanted to see if it would keep my toddler out of the cupboards. It does and I am sooo happy!!! Love this! Such beautiful countertops. Someday I'd love to switch ours over to something like this; it's gorgeous! Thank you for sharing at Inspire Me Wednesday. Featuring you in next week's issue. That looks Ah-mazing! Love the white cabinets and I am swooning over those gorgeous countertops! Pinned and tweeted! It was fun to party over at #OhMyHeartsieGirlWW with you ladies! Have a fabulous week! This is fantastic! The butcher block is gorgeous. I have counter top envy!! Really beautiful–I am hoping to remodel our kitchen soon so this gives me another option. Thanks…..I think lol. Thanks for linking up at #OMHGWW! Your countertops are gorgeous!! I keep trying to talk my hubby into butcher block tops but so far no luck. Your countertops and island are beautiful! Nice job! I love the clean lines and fresh color scheme. Gorgeous! The whole kitchen looks so clean and modern. And I love the idea of no hardware on your cabinets! I'm sharing this on my facebook page (Crafty Wife) later today and pinning it as well! I am leaning towards butcher block counter-tops, and the grain in yours is gorgeous. I love the way it looks with the white and the metal, exactly our style! I love the island too, wish I had room for one, I may be able to work in a setting area at the end of the cupboards, at least I hope to. This is still on a dream list, but now I have a clearer idea of how it will look, thanks so much for sharing! Your husband did an awesome job Amber! Your kitchen looks lovely and all that counter space must be nice. Ha, I'm the same way, I just know how to use a glue gun. 🙂 Thanks for sharing at Talented Tuesday link party! Your kitchen looks beautiful! Your husband did a wonderful job. I always enjoy seeing where other folks bake and create – thank you for sharing part of your home with us at the Hearth and Soul hop! It looks amazing! I also love the clean lines and almost industrial feel to the stainless island. Congrats!! 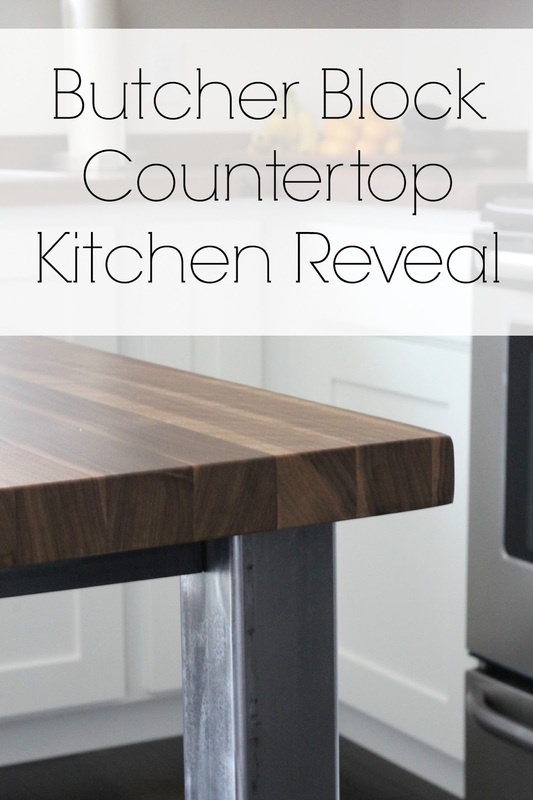 awesome countertop with us at the Healthy Happy Green and Natural Party Blog Hop. I'm pinning and sharing. What thickness did you go with on counters? Ours are about an 1" and a half.